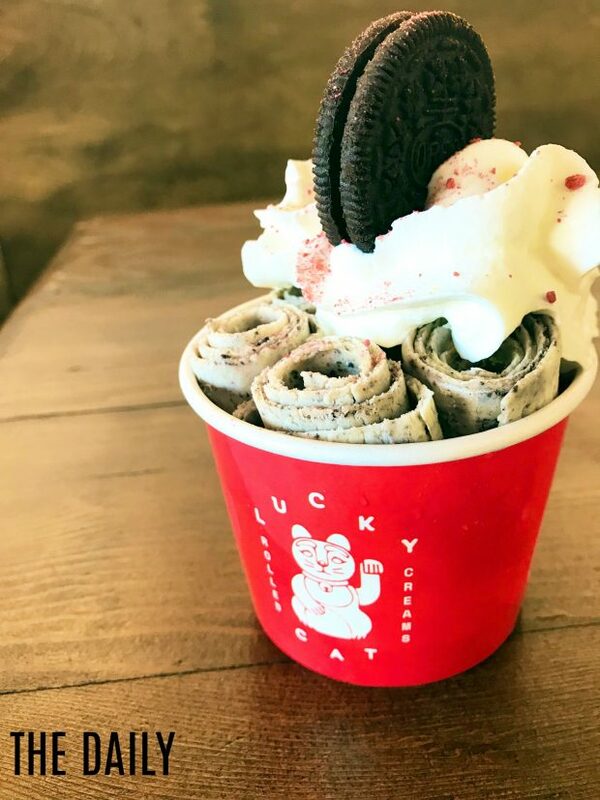 Have you heard of or seen the ice cream trend of rolled ice cream? When we saw this delicious trend hit a local neighborhood, we knew we had to have it. So after a particularly rough day one week, we decided to make a family outing to try it out. 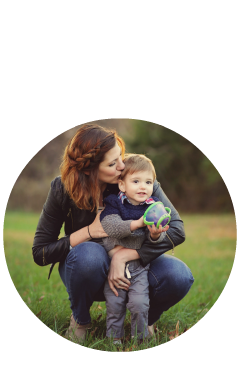 We went right after work, around 4:30 in the afternoon, and it wasn’t busy at all, which, with a toddler who can be a dream or a nightmare, was right up our alley. 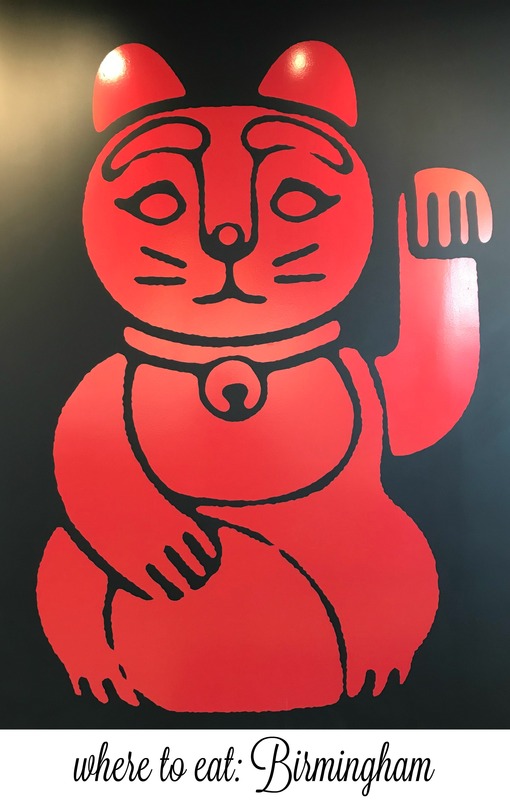 You’re greeted by a giant mural of a maneki-neko ( lucky cat) and an inviting counter. You can see that they’ve got their liquor license, so you can enjoy a beer, wine, or sake with your rolled cream! 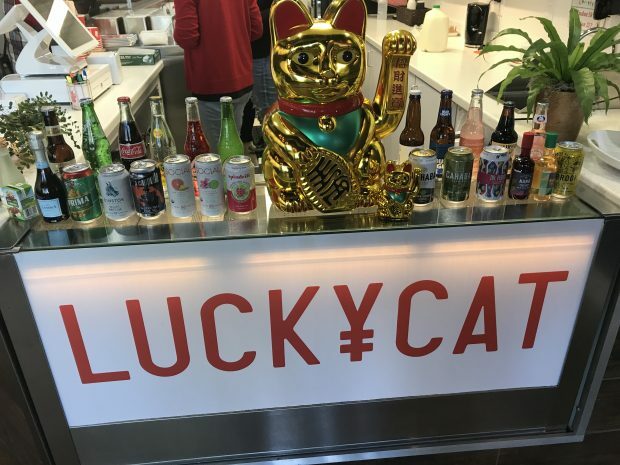 They have all sorts of flavors, and we had heard that the portions were pretty substantial and that a small could accommodate two people. Sheffield and I got one and split it, and B got his own. But let’s be real -he shared with Sheffield, too. They also have plain vanilla and chocolate if you’re not a fan of stuff in your ice cream. B got The Daily – which is a vanilla base with Oreo cookies and freeze dried strawberry powder. It was delicious and very similar to a cookies’ n’ cream type of ice cream. They topped it off with an Oreo cookie, which boogs tried to steal. Sheff and I split The Trolley Car – vanilla ice cream swirled with caramel and chocolate, topped with whipped cream, mini chocolate chips and a brownie bite. Sheffield took that brownie bite so fast from the ice cream, I have no idea how good it was. But since he pretty much swallowed it whole, I feel comfortable saying that it was delicious. He also really loved the whipped cream – and of course the ice cream was amazing. Who doesn’t love caramel and chocolate?!? 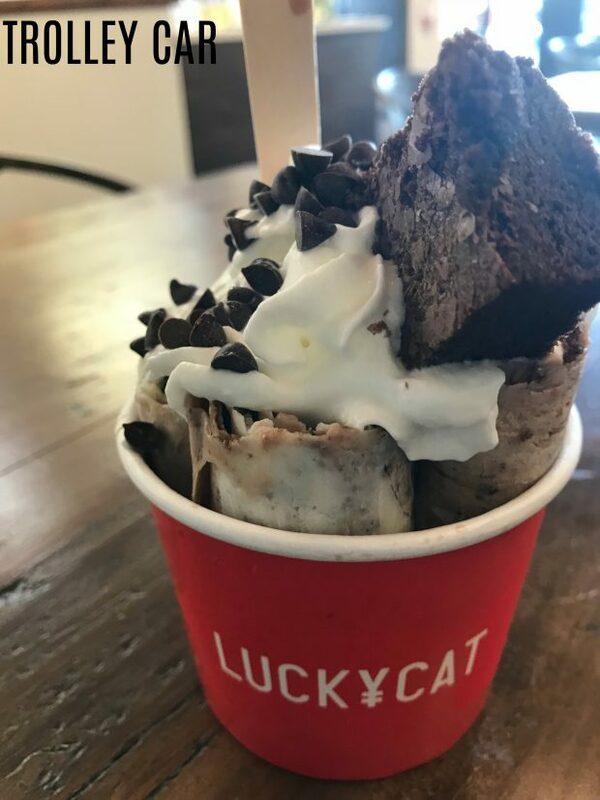 You can find Lucky Cat Rolled Creams on 18th S in Homewood, AL. I need this in my life ASAP. They both look so good, I would have a hard time choosing which one to get! I haven’t seen this, but it looks delicious!